I made it home yesterday after an exhausting, ramshackle trip that ended up being a whole lot of fun. We seemed to have dispensed with all of the negativity of the last tour. I'm not sure why, maybe it was the warm weather, the carefree attitude of the band or the daily festivals that were more of a plug in and play type affair. Man, I love those crazy little guys. We had a rather muddy day at the gold coast, then drove into Brisbane the next day. I spent most of the afternoon with my abundantly tattooed friend James. I smuggled a pair of iPhones into the country for him (they don't go on sale in Australia for another few months). He was overwhelmed and about as excited as a four year old with something shiny. When I remarked that the combination of his adult ADHD and an iPhone meant that he had the attention span of a fly his wife said 'well, every once and a while a fly will land on something and just sit there for a second.' Regardless, my time in Brisbane was a blast as usual. If you can't tell, the cover of the brisbane guide book was clearly taken from my hotel room. Fancy that. The show in Brisbane was at the awful little place called The Arena. It must have changed names several times over the last few years because I know I've been there before. It surely had some equally deceptive name like 'the palace' or 'the velvet omelet' or something ridiculous alluding to how posh the club is when, in fact, it is a complete and total shithole. I was there during my first trip to Australia with You Am I, then again with Death Cab last year. I remember it well because not only is it the antithesis of an actual arena, but the lighting desk froze up mid-show because someone had spilled a beer on it a few days prior. Same place, and, oddly enough, same lighting desk. The band was great in spite of everything though. They rip through every old song that anyone who knows a damn wants to hear, and the pair of new songs aren't half bad either (one is something about a 'rock and roll amputation' which may be a reference to a dodgy medical procedure that I am unfamiliar with, but it just sounds about right when an angry, grizzled Scottish man is bellowing it at you). They really write songs that are as simple as the Ramones, and now that the band is made up of members of both Lush and Ride, it really is a howlingly decadent set. So much so that a security guard in Sydney came up to me to let me know that he thought, with his well trained ear, and years of musical training, that something was feeding back on stage. I pointed out to him that there was a pale, chubby guy with unruly hair and a devilish grin holding a hollow bodied electric guitar to the faces of a pair of six foot-high amps that were driven by about a half dozen distortion pedals. He nodded slightly as if wondering why anyone would ever want to do that. It wasn't half bad living out of a bag again. The weather was warm, and while most of the days were long and involved extensive air travel the crew were well up for it. We often traveled with other bands on the festival as well, which, needless to say is occasionally a liability. On one flight in particular several folks ingested an instantly intoxicating combination of ecstasy and burbon that led to plenty of giggling, a little bit of in-seat dancing and some hilarity involving a digital camera and a sleeping Jonnie Marr. Or so I hear. Which is down the street from Bionic Ear Lane. Just a casual observation. Our last show was in Perth, at the promenade, which is just about in the middle of downtown. Odd place for an all day music festival. But still a pretty amazing spot. I watched Queens of the Stone Age after our set. They destroyed every show on the tour. It was great in every possible way. They would sing Duran Duran songs (who were playing directly after them) sporadically throughout the set, and just generally raised hell. I made it back to the hotel pretty early (I tended to ditch before The Smashing Pumpkins went on, it's an ungodly noise that I was never very fond of). Since it was the last night with a bunch of pals some drinking was implied. I was pretty well pickled by 10:30 and yammering on about how cool Kurt Vonnegut was between bouts of tossing raw ham into a big glass lamp that hung in the hotel lobby. Such is life. I left for the airport at 4 AM for a 5:45 flight that was populated almost entirely by the Fijian rugby team and Billy Corgan. The weather toady has been irritatingly inconsistent. The sun is hanging bright in the sky, but the sharp breeze from all angles makes it about 45 degrees. When I walk outside it feels like I'm breaking out in cold sweats. 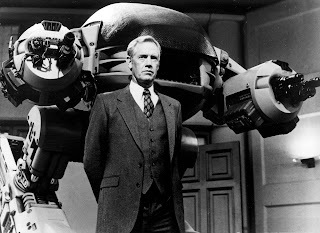 Tonight The Castro theatre is throwing caution to the wind and showing a double feature of Verhoeven's Robocop followed by The Terminator. It will be amazing.